Updated November 27, 2017 for new yarn and edges. There are an amazing number of ways you can use the Showy Decrease and every time I think I’m done … pop! Another one comes to mind. I had planned on announcing the Showy Cable several months ago until I swatched the first Showy Garter sample and was completely side tracked by how much fun that is. The Granite Lake Shawl took much of my time and we are by no means done with Showy Garter projects but the Flat i-Cord strap top that’s about to be announced is definitely a summer project and since it uses the Showy Cable it’s jumped up in line. Whenever there’s a new announcement about a Showy Decrease application, I like to stop and review all the other ways we’ve already discussed, just in case you’re a new reader or forgot one along the way. Nuance announcements always come with a tutorial and simple project. That’s the case here with this cowl. 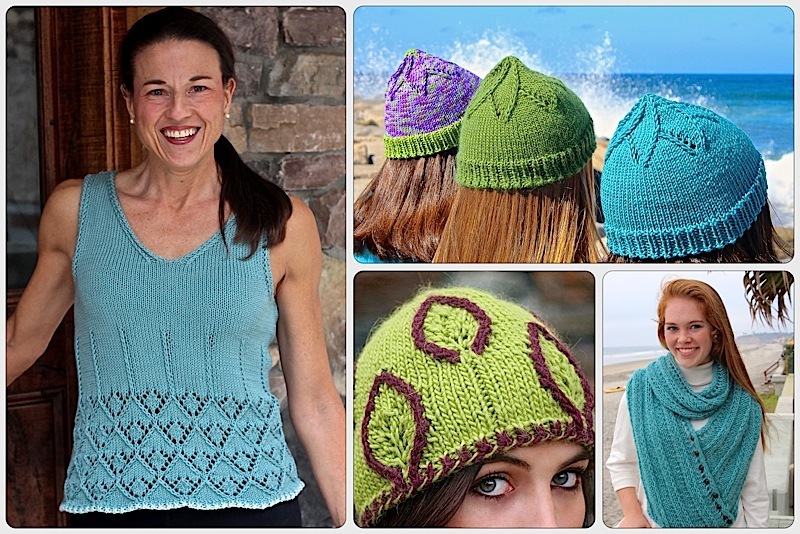 It uses the same cable pattern as the Dubhlinn Summer Top that’s coming next. Like other faux cables it doesn’t add a lot of bulk but it does add more depth that the alternatives. It can be knit with or without eyelets. They can be joined with a beautiful smooth double decrease. To say I’m enthusiastic about this version of the Showy Decrease is an understatement (shocking, I know). There are about 6 projects already knit with this technique and I have even more sketched out. One of my favorites is the yellow hat in the collection above. It will be announced this fall. How Does the Showy Cable Work? If you’ve knit anything with the Showy Decrease, you won’t be surprised to hear that it’s very simple. Let’s take a look at the very first Showy Decrease tutorial chart we discussed. It shows how to add lines and texture to stockinette. OK, now lets break up the lines, add some ribbing and … ta da … the Showy Cable. The chart here illustrates the right-leaning eyelet cable. You can see how we break it up with a rib pattern. The cowl pattern includes right and left leaning eyelet cables and a mirror cable with center join. The sweater adds right and left leaning standard cables which simply use a different, non-eyelet increase. You can see them in the yellow swatch above. The cowl comes in 3 gauges and weights. I added this pretty gradient version as of November. You can link to the blog post reviewing that yarn and announcing the updates to the pattern below. The pattern includes tutorials for the Woven Cast On and Knotted K2Tog Bind Off. A small project like this is the perfect time to try them. They add form and function since the edges are more flexible which is needed to get the smaller cowl over your head. The 2-strand Knotted Bind Off, one of my favorites, really does flare the end out with it’s bulk. This teaches you everything you’ll need for the Dubhlinn Summer Top and also for the more complicated pattern designs coming this winter. Take a look at the chart for something I’m swatching now. It’s a sweater which means it will take months but I’m already in love with it. We’re going have a lot of fun with this new faux cable. I couldn’t resist this yarn by Freia Fine Handpaints and so knit this pretty folder version of the cowl. The pattern has been updated to be more official, includes 3 gauges and multiple cast on options. Please click on over to the related blog post for more information. This entry was posted on July 23, 2017 by Laura Cunitz in Free Downloads, Nuances, Showy Cable, Showy Decrease and tagged Faux Cable, knitting, Showy Decrease.